This was right before university started, so around that time I picked up, with my mum, a pretty powerful spot cream that you need prescription to use (yep, it got that bad). Very quickly, my spots faded away. But for a few years, I felt so insecure about my discolouring that I could never be seen without makeup. Even up to 6 months into my relationship with my boyfriend I’d still pop a bit of powder on my forehead to cover up the discolouring (of course, I don’t do that any more). As discouraging as it was whilst it lasted, the discolouring eventually cleared up in its own time. Then slowly but surely, my skin has just been… fine. I don’t even have to use the powerful spot cream anymore and up until a few weeks ago, I didn’t even really have a skincare routine anymore – I stopped taking my makeup off before bed, and all I’d do was scrub my face in the morning. Now, for a few weeks, I’ve decided to stop being lazy with my skin and have been trying out a new skin care routine. It has definitely made my face look a lot more fresh, and feel a lot healthier. I’ve even got a few skin complements on my skin from my flatmate and my mum! First of all, a little disclaimer and a bit about my skin type. I have combination skin, although for the most part, it definitely leans more towards the oily side – especially in the summer. I also definitely do not have sensitive skin. 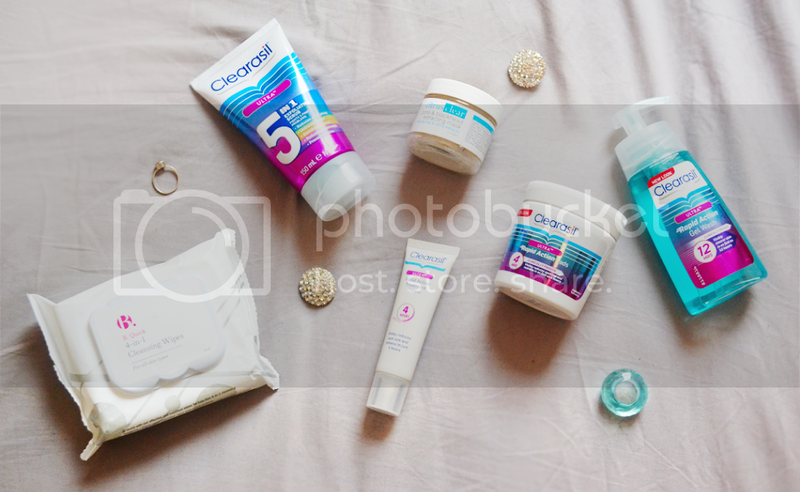 My routine is absolutely full to the brim with Clearasil products which are quite strong and are not always recommended to those with sensitive skin, so keep this in mind as you read the post! To start off my day, I like to use a Clearasil scrub, Clearasil really offers such a wide range of scrubs and I generally switch between them every few months depending on how I’m feeling. I’m currently testing out their 5 in 1 Face Wash which fights spots, oil, blackheads, marks and even unblocks pores. What I love about is exfoliating scrub compared to many that I’ve tried it that it’s not too rough on your skin. A good scrub in the morning definitely makes me feel fresh and clean for the day ahead. Post shower, every other day I wipe my face with their Rapid Action Pads; these are quite strong so I wouldn’t use them every day, they are particularly useful on those days you might feel a big, random spot growing. Lastly I moisturize my face with the Clearasil Rapid Action Treatment Cream, or on occasion with an oil-free moisturizer, depending on what’s sitting in my skincare collection which varies quite a bit at times. After a long day, I always start off by wiping my makeup off with wipes, currently I’m trying out these B. 4-in-1 cleansing wipes; I’ve heard very good things about the B. brand and also saw that these were for all skin types so snatched these up last week in Superdrug, typically however, my go to face wipes are from Simple. 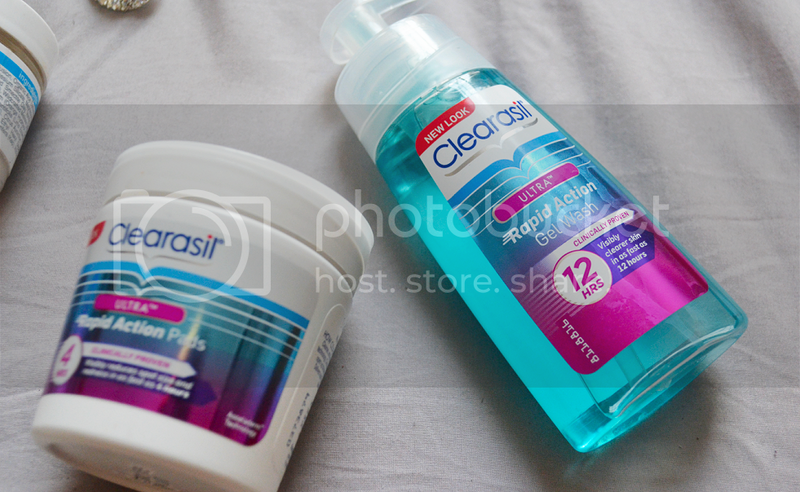 After this I wash my face with the Clearasil Ultra Rapid Action Gel Wash – this works absolute wonders. Back in my secondary school days if I ever had a massive spot on my face I’d put a little bit of this on the spot and let it sit over night, these spots would always have gone down by the morning. Lastly, I apply the ClearasilRapid Action Treatment Cream to my face before bed. A few times a month (if I ever get the time at least), I like to ‘pamper’ my skin a bit more and I’ll slap on a face mask in the morning before I shower. 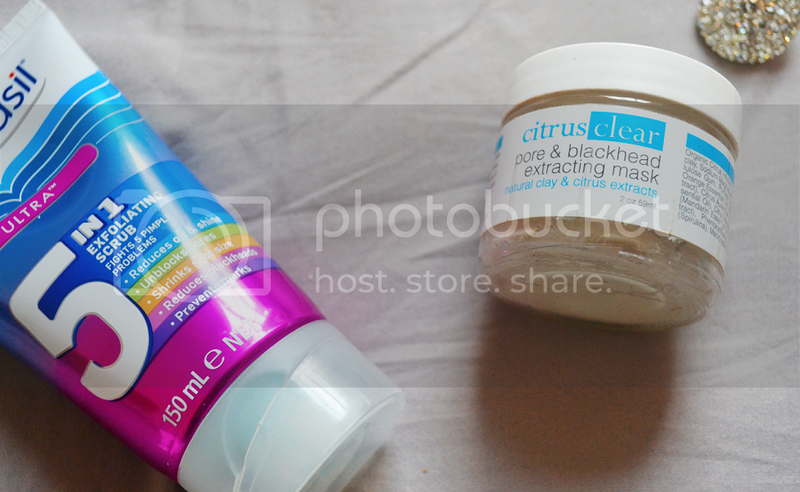 Currently I’m using the Citrus Clear pore & blackhead extacting mask*, which I wrote a review on a few months back that you can read here. On occasion, I’ll also steam my face – steaming opens up yours pores and genuinely leaves you feeling so fresh, it’s amazing. If I had the time to do it every day – I would. Anddd, there you have it. My current go-to skin care routine. It definitely gets long at times, especially after a long day at university when all I want to do is get home and sleep ASAP. But it’s really just a little bit of effort for a really long term gain! Hope this can give you a few ideas if you’re thinking of switching your skincare routine up for the summer. I have one month left of exams until freedom. In fact, this time next month I will be on a beach in Portugal. I am so insanely excited! I am definitely due a big summer shop before then, so if you have any ideas of what places I should check out, please leave them in the comments below. I am on the look out for some flat sandals, summer sandals and ballet pumps. Post exams also means I can get back to regular blogging rather than once a week, even taking some revision time out to write up this post is giving me hypertension. 4 Responses to "My Skincare Routine 2016"
I love clearisl products, they work the best on my skin too! Best of luck with your exams! Best of luck with your exams and this is a really nice post on skin routine, I’ll definitely check them out!